While the finish has been drying on my current project, I turned my attention back to the Voodoo Telecaster I built a few months ago. I had never got round to giving it more than a perfunctory setup and nor had I wired in the two push/pull pots that I had fitted. At the time I wasn’t sure what I wanted to do with the switches so had just gone with the standard Tele wiring to start off. Last night a spent a few hours tweaking the truss rod and action. 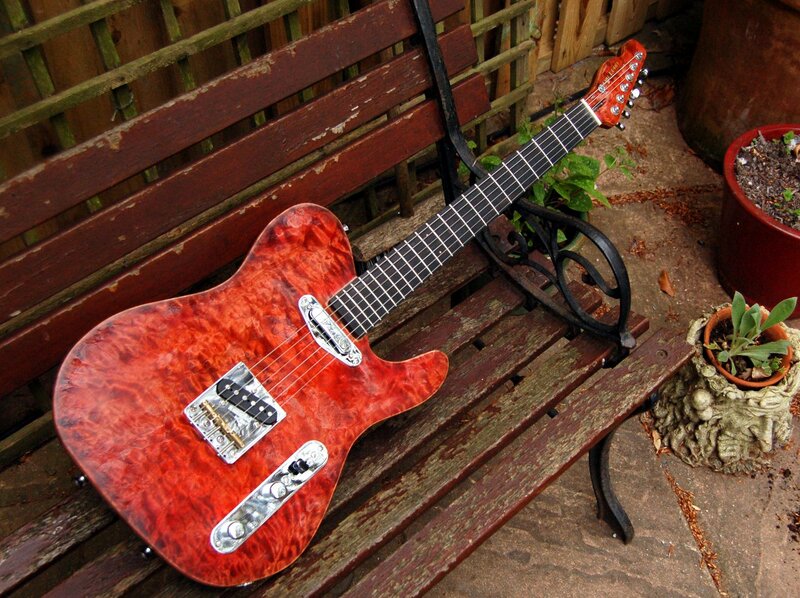 It has transformed the guitar from something that was OK, into a beautifully playable guitar. Now on to the wiring. I’ve decided that the first push/pull pot will be a phase switch. This will of course only work when the pickup selector is in the middle position. It requires a modification to the neck pickup. As standard, one end of the coil is attached to the pickup cover and then on to the ground lead. I’ll snip this connection and run a separate wire to ground the pickup cover. The second push/pull is going to be a “turbo” which will switch the volume and tone out of the circuit. A passive volume and tone control will sap somewhere between 8-12db from the pickup signal. Bypassing these passive controls gives a big boost. It is at the expense of having any control (other than the pickup selector switch) but it just sounds great when over-driving the pre-amp stage of my valve amp. 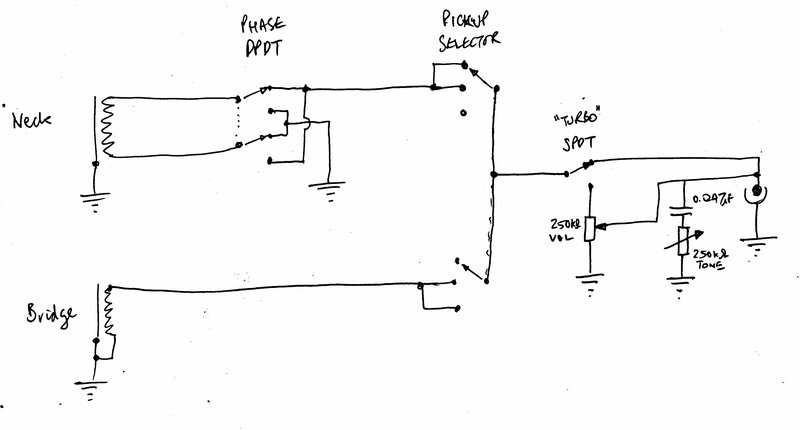 Here’s the schematic I’ve sketched out. The neck pickup first goes to the phase switch which effectively flips the pickup’s coil round in the circuit. From there it joins up with the bridge pickup at the selector switch. The selector switch goes into the “turbo” switch. When engaged the signal is routed through to the standard Tele master volume/tone controls. When disengaged the output from the selector switch goes directly to the hot of the jack socket. Edit 1: After completing the rewiring and playing with it for an hour or two I decided to disconnect the “turbo” volume/tone bypass. It just wasn’t working for me. I had previously tried this with humbuckers and P90s and loved it, but with the sharp, cutting single coil pickups it just didn’t sound as I expected. I’m going to investigate the “Arlo Cocked Wah” mod. Edit 2: I’ve just spotted why the “turbo” mod wasn’t working as I’d hoped. If you trace the scematic through, then you can see, when the turbo mode is engaged, is still allows a path to ground for the hot signal via the vol and tone pots. No wonder I didn’t like the sound, it would have been the same except the volume knob wouldn’t work properly. To correct it I need to use the second poles of the turbo switch to disconnect the vol/tone part of the circuit from the hot. When I get time, I’ll redraw the schematic and retry this mod. This entry was posted in guitar and tagged build, diy, guitar, phase, pickup, project, setup, switching, telecaster, voodoo, wiring. Bookmark the permalink. nice write up dave, very unique wiring, and the turbo idea is great… hopefully your re-wire will remove the vol/tone from the circuit and give the pickups a clean path through. Thanks Alfie. Spotted the problem now. Just need to get a few minutes to redraw the schematic and rewire. Mind you, it is raining today so the bass build goes on the back burner. Hopefully I’ll find time this afternoon. If not then over the weekend.